I’m prone to obsession and I now realize that about myself. But how does one classify obsession and at what point is it just part of who we are? My earliest memories are focused on being obsessed with seeing the world. I re-read the “Charlie Brown’s ‘Cyclopedia” volumes about other cultures hundreds of times. When I was older I absorbed everything I could about other countries. On my walls I didn’t have a Michael Jackson or Madonna poster, I had the flags of the world. My love of travel has always been part of who I am, and from an early age that was largely focused on Great Britain. I desperately wanted to visit and experience the culture of my ancestors, which is why I was determined to make that happen the summer after I graduated from college. I had worked several jobs throughout my senior year to be able to afford my great adventure, gradually earning enough to book airfare to London as well as what I thought was enough spending money for about 5-weeks. I wasn’t going to go on a pan-European escape, no. Instead I was keenly focused just on the UK, wanting to slowly experience as much of the country as I could. I should probably write about that epic adventure, a lot happened to me along the way, but today I want to focus on one of the stops I made back in 1998, the ancient city of York. Always fiercely interested in history, back when I was 22 York was one of the cities on my “must-visit” list and although I don’t remember a lot about those couple of days in May 1998, I do remember leaving happy that I had visited. It’s those gaps in my memory though that had me the most excited a few weeks ago when I had the opportunity to revisit this amazing city. Since I had forgotten almost everything from my first jaunt through the Tudor-infused burg, it was very much like seeing it all again for the first time, a rare do-over in the travel experience. I was in Manchester for a few days on a press trip with VisitBritain following a conference in Belfast. I had never been to Manchester before and loved getting to know the city. I was also excited though for my day trip to York, which couldn’t have been easier. Getting up early on what was a gorgeous Saturday morning, I walked the easy 10-minutes to the station where I boarded the train for the one-hour trip to York. That’s it. The trip was pleasant enough and I enjoyed having some quiet time to read. Once in York, it was a very easy and short walk from the train station to the center of town. 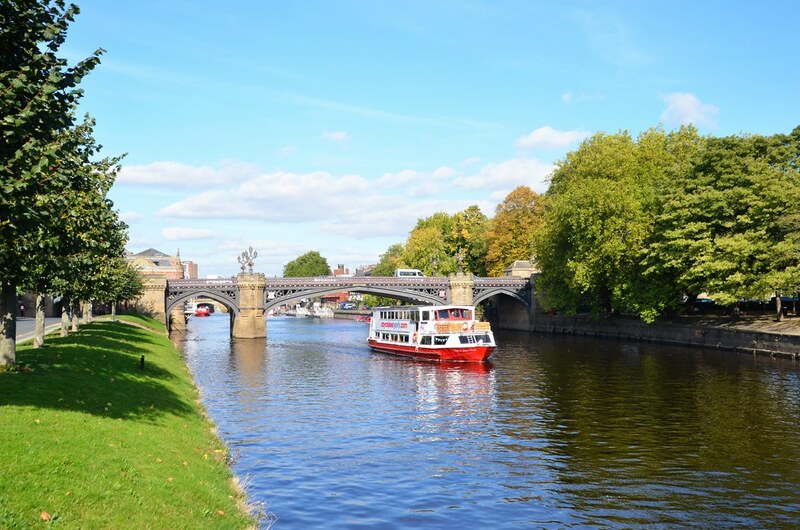 There are many train options between the two cities throughout the day, making it a fun and easy day trip whether you’re staying in Manchester or York. 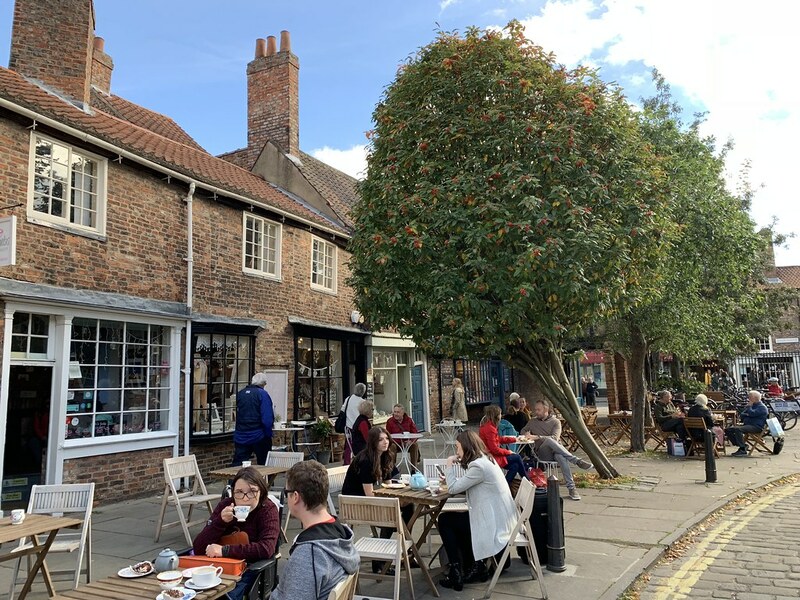 Once in town, York has done a great job of helping out tourists with plenty of signs and a robust tourist office to aid visitors with whatever they want to see and do. Since it had been so long in between visits, I felt like I needed a little help getting started which is why I joined the fine folks over at York Cycling Tours for a morning of biking around York. With some exceptions, York is fairly flat, making a bike tour a great way of seeing a lot of the city without too much effort. The tours usually last between 2 to 3 hours but, as my guide Andy pointed out, that depends on whether or not guests want to include extra stopovers, like a pub visit or two. I had a lunch appointment, so no pubs for us that day, but we instead enjoyed a small group tour through the entire history of York. Most visitors to the city concentrate their time in and around the old historic center, which is fine – there’s a lot to experience there. 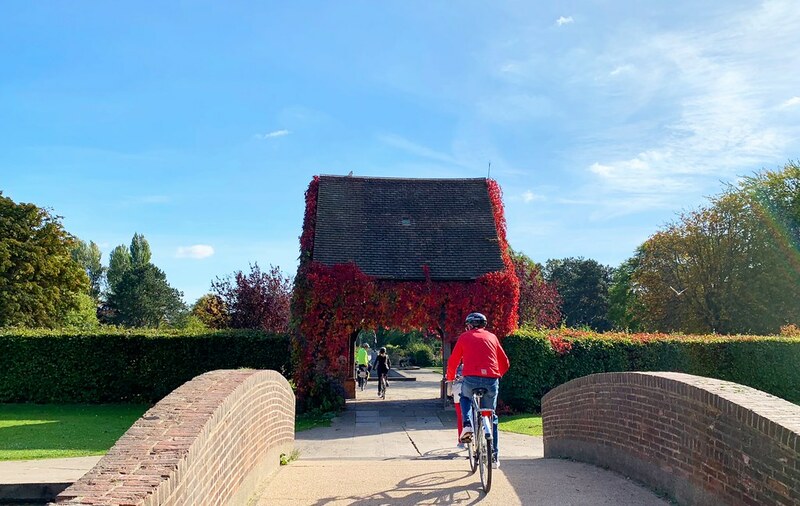 But one of the great advantages of being on two-wheels is that we were able to bike all around the city, to get a better idea of York beyond the typical tourist hotspots. Andy wasn’t just a great leader, he was incredibly knowledgeable about all facets of York’s incredible past, from the Roman era up through to modern times. 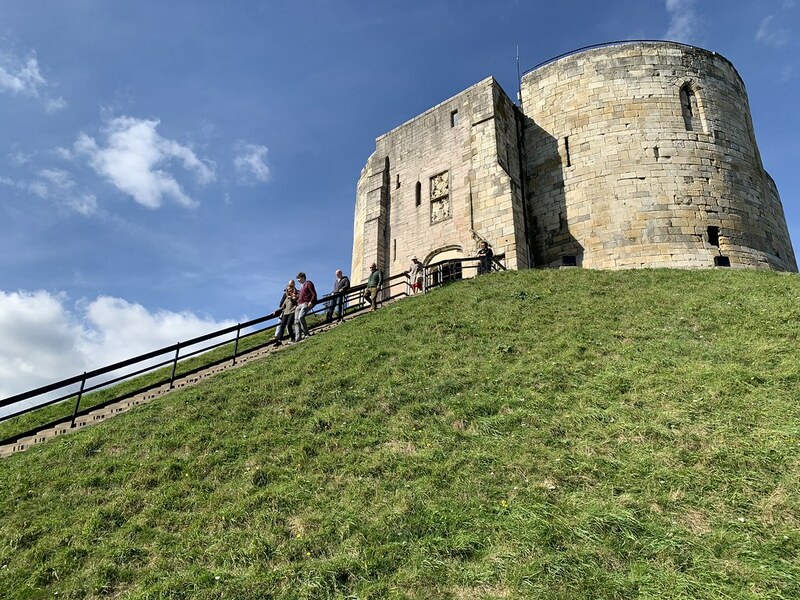 We stopped at old gates along the city walls, the enormous racecourse and even an amble through a city park, complete with a stop to learn more about York’s long love affair with chocolate. It really was the perfect way to get reacquainted with York and set me up for a fun afternoon of exploration. The nice people over at York tourism had sent me a list of possible ways to spend my time while in their fair city. I know they meant well, but I mostly disregarded their advice. Well, that’s not quite true, I did use some of their suggestions, but only as a loose framework for my own random wanderings. Usually when I visit new cities, I like to methodically visit the important sites and, in general, just keep myself busy. York was a little different. It was as beautiful a day as I have ever seen and the town was popping with people. The weather surely drew out a lot of folks, but there were also at least two or three festivals going on, which meant York was bustling with activity. I love that and I wanted to be part of it all, so I threw myself into the scrum to see what would happen. The result was one of the best days I’ve enjoyed in a very long time. After an incredible lunch at Café No.8 Bistro, I set off to find the part of town known as The Shambles. (Side note, my one regret in York was that I didn’t have time to properly enjoy the culinary side of the city. It honestly looks amazing and I bet an entire trip could be centered on the food alone.) Often considered to be one of England’s prettiest streets, the Shambles is a very old street with overhanging timber-framed buildings, some of which date back as far as the 14th century. Modern stores aside, this is the street we Americans think every English street looks like and its quirky history was a big part of my afternoon. After getting lost more than once, I did eventually find my way to an important historic site, Clifford’s Tower. 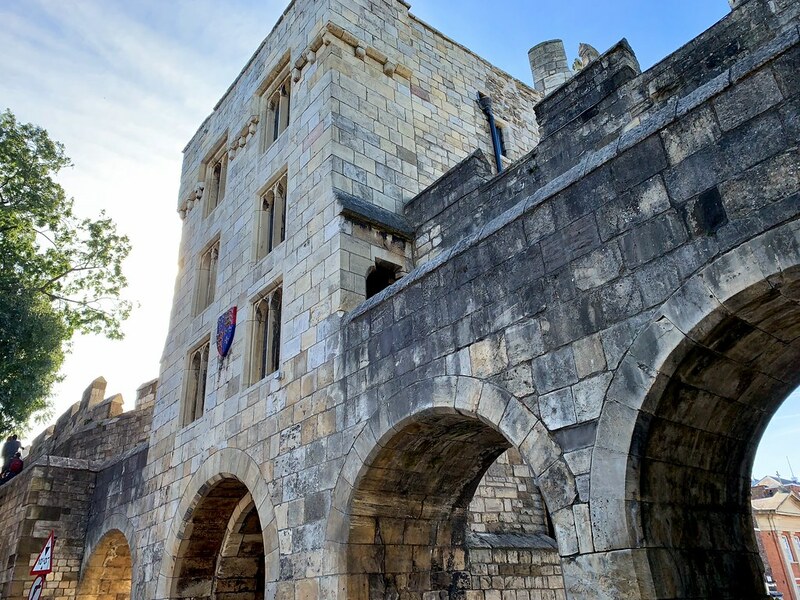 The tower is all that remains of York Castle, built by William the Conqueror and has been everything from a prison to a royal mint. I was there because my handy dandy guide promised “stunning panoramic views.” While that wasn’t quite true, it was still a nice place to visit and the views weren’t entirely terrible. No, for amazing views I had my sights (pun intended) firmly set on one place – York Minster. This massive cathedral is the only thing I remember from my first visit, which is a testament to just how important York Minster is. There’s been a church of some sort on the site since the 600s but the massive Gothic cathedral we see today was finished in the 15th century. York Minster has played an important role in history any number of times, abut many people are drawn to it today thanks to its stained glass. The voluminous amount of medieval stained glass is some of the oldest in Europe and is impressive to see in person. While all of that was nice, I was there for a different reason – to climb up the Central Tower. I always love heading to the top of any city’s highest point and, thanks to the weather, I knew that I would be well rewarded in York. I almost didn’t make it though. I didn’t realize that access to the top of the cathedral is timed and kept to a scant 50 people per time slot. Thankfully I managed to snag a ticket for a later time, which, as luck would have it, was ideal for the afternoon light. Called the Tower Challenge, it is 275 steps up a narrow spiral staircase to the top of York Minster. While not for the faint-hearted, it also wasn’t the most extreme climb I’ve done and the views at the end were well worth any huffing and puffing along the way. I couldn’t believe my luck with the weather; I could see miles and miles off into the distance with the hills of the Yorkshire dales clearly in focus. It was the perfect way for me to end my afternoon in York and a great way to better appreciate the beauty of the city and region. I sadly ambled back to the train station where I boarded my return coach to Manchester. Let’s be clear, York needs a lot more time than a day but I’m so happy to have had at least that much in this remarkable city. York has everything that we look for as tourists, from raw beauty to impressive history and incredible experiences to enjoy along the way. I sincerely hope I can return to the Northern England to see more of York as well as the many other cities and towns that make this part of the UK so very special.